Digital marketing is becoming more and more complex. How can artificial intelligence be used to simplify the life of marketers, and improve ad campaign results at the same time? 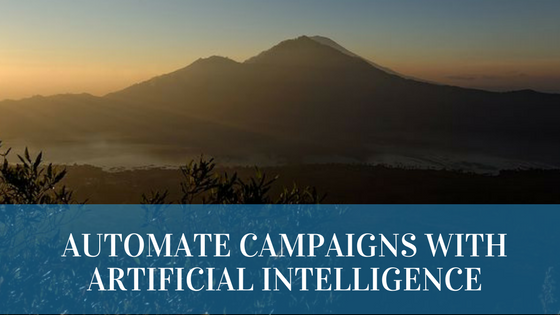 In this blog post, I interview Or Shani, the founder of Albert Technologies Inc, one of the most well known companies in the space of AI-driven campaign management. Albert is an AI-based virtual marketer than can purchase, analyze and optimize marketing campaigns autonomously, and AI technologies like machine learning are being used to improve campaign results automatically over time. Albert is the first-ever fully autonomous digital marketer, managing and executing self-driven digital marketing campaigns for some of the world’s leading brands. CEO, Or Shani, founded Albert Technologies, Inc. and the company’s namesake AI platform in 2010 after identifying a problem: digital marketing techniques were far too manual. Considering the technological innovations in other fields, Or suspected there had to be a way for technology to handle the technological and data aspects of digital marketing campaigns, while humans continued handling the creative and strategic components. That better way was artificial intelligence. With his vision firmly in place, Or put together the core team necessary to build the technology. He chose his team and approach wisely. Five of Albert’s lead developers come from an elite special intelligence unit of the Israeli Defense Forces, which only accepts twelve members per year. And 80% of the company’s full-time staff is dedicated to R&D, revealing Or’s commitment to product viability and continued evolution. Digital marketing has become too complex and inefficient, Albert liberates businesses from the complexities of digital marketing – not just by replicating their existing efforts, but by executing them at a pace and scale not previously possible, freeing them up to focus on high-level strategy and creative. Albert serves as a highly intelligent and sophisticated member of brands’ marketing teams, wading through mass amounts of data, converting this data into insights, and autonomously acting on these insights, across channels, devices and formats, in real time. Why is he important to our customers? This eliminates the manual and time-consuming tasks that currently limit the effectiveness and results of modern digital advertising and marketing. Albert benefits include significantly increased sales, an accelerated path to revenue, the ability to make more informed investment decisions, and reduced operational costs. 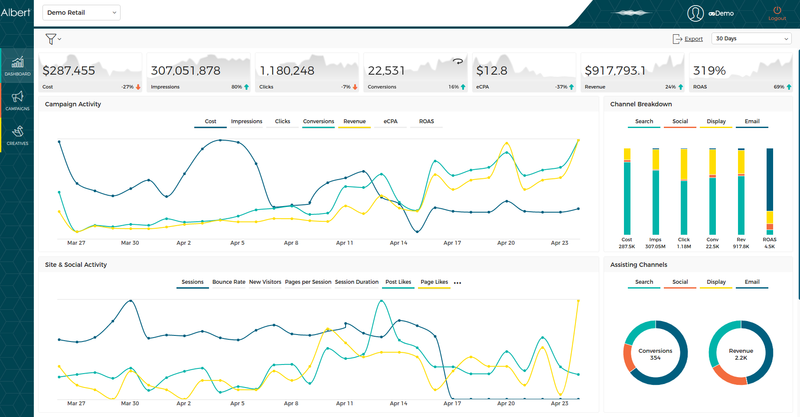 Our customers provide Albert with their business goals, KPIs, creative, known audience data and Albert creates a campaign specific to each marketer’s strategy and unique audience and utilizes self-learning algorithms to build off of his initial learnings. He manages full cross-channel ad campaigns from autonomous media buying – to campaign execution, testing and optimization – to analysis, proactive insights and recommendations across channels including social, display, search and email. The AI marketing technology requires very limited upfront input or ongoing management from marketers and can process millions of events per hour per client, differentiating it from current programmatic and marketing automation technologies. Albert not only tests hundreds of different campaign variants, but keeps them running long enough to determine which ones should be scaled up and which should be abandoned. This form of extreme multivariate testing provides a new level of insights and findings to the marketer, as well as recommendations on what should be done with what he has uncovered. Albert also autonomously applies past learnings when faced with similar situations in future campaigns. When applied to cross-channel, this holistic approach can completely break down silos that exist within current marketing organizations. Ultimately, the campaigning process is handled autonomously on search, social, display and email, as well as several devices, every step of the way. Albert was built from the ground up using Artificial intelligence; this means that it contains several elements including, but not limited to, predictive analytics and deep learning (which together comprise machine learning), expert systems made up of rules based on unique, vendor-created methodologies, natural language processing, as well as other proprietary algorithms. The combination of these elements allows a computer to observe patterns, draw conclusions from them, and adjust its behavior accordingly without the need for additional programming. Albert is autonomous, or self-driven, meaning that he can create digital marketing interactions unassisted, using the results of multivariate tests and deep-level analysis to make better decisions moving forward. Real AI marketing systems, like Albert, also thrive off experimentation – just like human marketers do – but is far better equipped than humans to gather, analyze and act on massive amounts of data in real time. Albert can run thousands and thousands of tests across hundreds and hundreds of variables in a very brief window of time. Whereas previous solutions simply analyze data and then wait for a human to make a decision about it; Albert uses the self-driving AI technology to analyze the data, determine the best course of action, execute on it, and then continually optimize as it goes based on what it learns in real-time and over time. AI Marketing (AI) leverages artificial intelligence-based software is currently the only solution that can accomplish this. Albert, specifically, is the only holistic solution, meaning it automates all channels and devices simultaneously (rather than simply handling one part of the process, which perpetuates an unwanted silo effect). The potential here is limitless. All data-driven processes will be automated and eventually autonomous. The consumer will continue to require more and more convenience and unique experiences. As businesses see the results of AI they will want to implement it more broadly within the organization. And as the non-AI users see how much success their competitors are having with AI, they will have almost no option but to adopt it. AI is out there, now it will be up for grabs to the businesses who dare to take the “risk”. Manual processes will continue to become automated one after the other, across industries, as the technology improves and user information gathering gets more granular. Businesses will focus investment in AI in-house and externally which help them accelerate revenue and gain increased efficiencies. No. The key here is to understand that AI takes on the time consuming data management/analysis work in order to free the marketer to focus on higher-level strategic and creative work. The marketer remains in control and the AI makes decisions, within “guardrails” or guidelines established by the marketer. It follows logic that machines continue to do what they do best so that humans can focus on human creative efforts instead of wading through massive amounts of data, a task which humans are not built to complete as efficiently as machines or AI. Anyone can claim AI these days, it’s kind of a fashion statement. But at the end of the day the question remains, are your algorithms learning faster than other businesses algorithms? Is your system working autonomously on its own – taking decisions on its own? This is the difference between AI and say predictive tools that still require heavy manual intervention. In this interview, Or Shani gave a fascinating view into how AI can be used for automated ad campaign management.